Western red cedar is a softwood type that grows on the west coast of Canada. The wood of this coniferous tree has many applications, both indoors and outdoors. 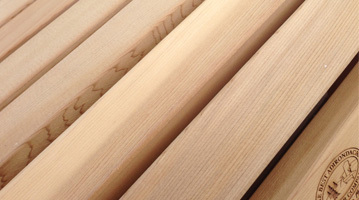 Red cedar is used for floors, wall panelling, terraces and garden partitions. Light weight, but also strong, almost as strong as oak. Exceptionally beautiful in structure and colour. Untreated, the wood has a clearly perceptible texture. The colour of red cedar varies from light amber to deep honey brown. Durable. Red cedar contains a natural preservative. This makes the wood resistant to weather influences and insects. 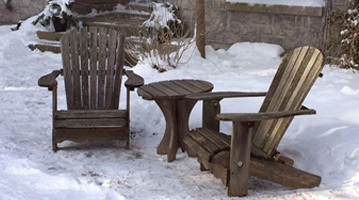 All these features give the collection of The Best Adirondack Chair a warm and unique look. To maintain its strength and durability red cedar does not need to be treated. This is what makes Red Cedar so special. After a while, and under the influence of different weather conditions, the wood can show some micro-cracks. This is easily prevented by sanding the wood with light sandpaper. If you like a rustic aged look, you can leave it as it is. If you leave the Adirondack Chairs untreated, the red cedar wood gets its beautiful silver-grey colour over time. If you don’t want the chairs to age and you want to preserve the beautiful original colour, you can treat the chairs. Make sure the chosen finish is UV-resistant. Sunlight causes the red cedar to age. You can treat the chairs with oil, paint or stain. Keep in mind that each treatment has a different result and involves a degree of maintenance. 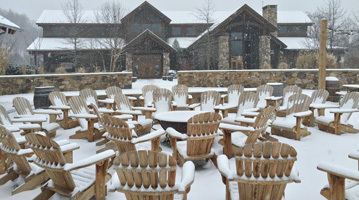 The Best Adirondack Chair can stay outside all year long. Western red cedar is exceptionally beautiful in structure and colour. Sunlight causes red cedar to age over time.